Sunday evening after the snow storm I was able to get out and ride. The water from the melting snow created some pretty good runoff in the wash making for some fun and somewhat tricky riding there. Since the soil here is mostly sand and rock it doesn't turn very slick and/or muddy. I've heard that you do have to watch out for sink holes or "quicksand" but have yet to experience anything too serious myself. You do of course have to be careful not to get your front end sucked in when the sand is saturated in some spots. 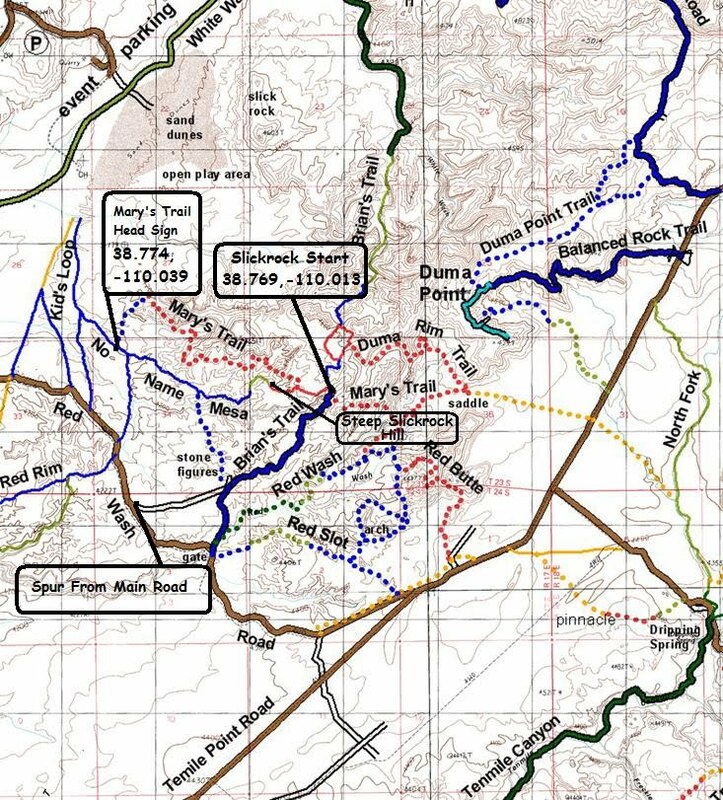 I decided that I wanted to do the entire Mary's Trail starting at the North West side, something that I had not done. This is a fairly short moderately difficult trail. The spots of snow made it hard to make out the white lines in some spots, but once you're on the trail it seems very well marked and easy to follow. The trail head is only a short distance from White Wash Sand Dunes where we were camped. 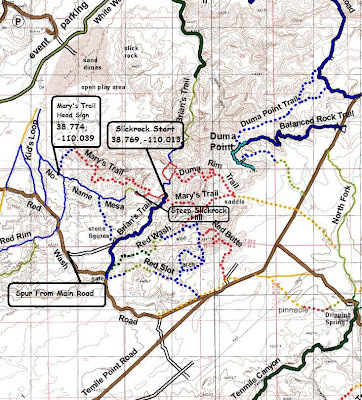 Below the video is an excerpt from the Full Trail Map with key gps points. The red dots designate slickrock single track. The "slickrock start" point on the map is where the slickrock starts from the South side of Brian's Trail. Nice, real nice. Looked cold along with the snow on the ground and the white trail markers. Wow, I think Chicken Corners has a bike trail, pretty hairy at the end.